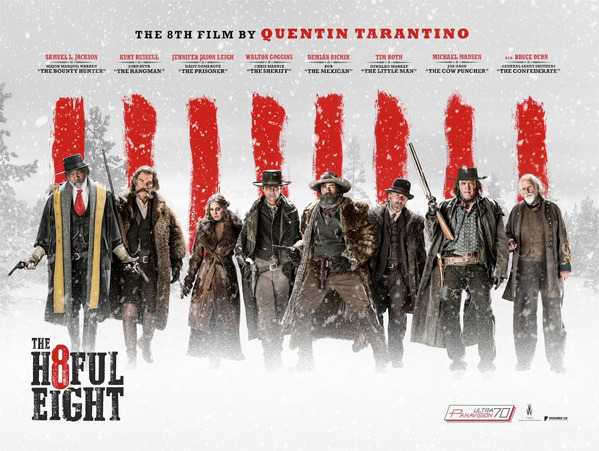 "We've got eight people that are very different, very dangerous and to varying degrees, hateful…" The Weinstein Company has debuted a new featurette for the upcoming Tarantino movie The Hateful Eight, starring one helluva ensemble cast. The eight who get stuck in a blizzard at Minnie's Haberdashery are: Samuel L. Jackson, Kurt Russell, Jennifer Jason Leigh, Walton Goggins, Tim Roth, Michael Madsen, Bruce Dern and Demian Bichir. This featurette explores the dynamics and relationships of the cast, to compliment the technical featurette about 70mm from before. The best part about this is the cast, and Goggins is one of my favorites, plus Jackson as always. Check out this fantastic 4-min featurette below. Watch the most recent trailer for The Hateful Eight here. More info on the official website. \ Full 70mm list! I always get so damn excited when he puts out a new one. And I've never been disappointed. It's an event for me, and this is probably his strongest cast since Pulp Fiction. Damn. I still have no reservations about this film. This looks great! are you as pompous in real life? no bo, pompous is correct - and you prove it every time you post. Bo, your friends may enjoy your opinionated approach to things, but it shows a lack of self awareness not to realise that an online forum lacks the critical ingredient that makes your attitude seem funny to your friends; namely context. Your friends have known you obviously for some time and are aware of a lot more of you than some isolated and what seem outwardly like pompous, judgmental and dismissive assessments of things that you currently only have limited information on. Giving you the benefit of the doubt, I can see how in certain contexts your commentary would be funny or ironic, but in isolation from such contexts AND without being able to hear things like the tone of your voice or see your face, it is equally possible you could just be being pompous and dismissive, as Dan said. As for the film, well it looks like a fun break from the comic book dominated box office. A fair response Bo. You got very much to the crux of what I was saying with this point in particular though: "Also easy to project what is going on within one's self onto to others hoping to experience the relief from one's own short-comings by placing them upon others. Eh?" Bald text divorced from visual, auditory and historical context is almost like a literary form of the Rorschach Test; people fill what they read with all their own assumptions, prejudices and insecurities. So in a sense, you are right that the response of people like Dan says plenty about them, but by the same token the "bald text" can be read so many ways without adding layers of context on top of it that such reactions are inevitable, particularly when your comment is being critical of something people like.